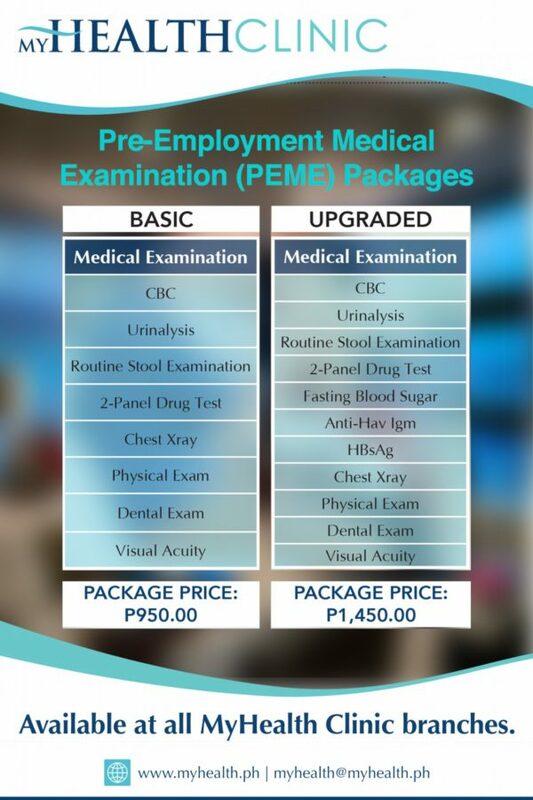 Avail of MyHealth’s affordable Pre-Employment Medical Packages. 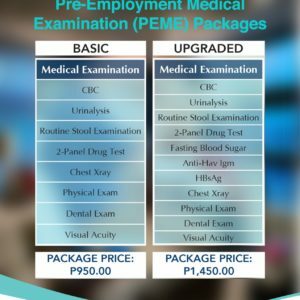 For only P950.00, get the Basic PEME Package, which includes the following tests: CBC, Urinalysis, Fecalysis, Chest X-ray, Physical Exam, Dental Exam, Visual Acuity Test, and 2-Panel Drug Test. Recommended for office-based jobs. HOW TO AVAIL: Just visit your preferred MyHealth Clinic branch. No need to set an appointment. You may also purchase through our online store, and show your online payment confirmation (no need to print) to our clinic staff upon visit to your preferred MyHealth Clinic branch. Please don’t forget to bring 1 valid ID.